global book market made possible by the conjunction of the Internet, e-book technologies, DRM and print on demand devices, the three important legal concepts traditionally used in copyright laws have become obsolete: territory, property and the Aristotelian idea of justice. These three concepts were well suited to the tangible book market but are no longer for the virtual book market where persons matter more than objects. This book invites the reader to explore the specific functioning of the virtual economy. It proposes guidelines to modernize copyright law so that it can foster an adequate use of new communication technologies. For the first time in History, the humankind has acquired a technology that allows to create a world of information affluence and freedom of speech or its opposite. 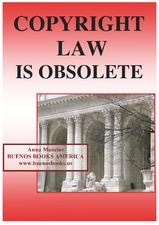 This book explains why the option for abundance and freedom must prevail, how the law can support this movement and what would be, to the contrary, the disastrous consequences of the other option. This book goes beyond a simple reflection on the book market and considers the choice of society, even of civilization implied by the use, right or wrong, of the new communication technologies.